The power of a color chartplotter for a fraction of the cost. ONE MOBILE APP with hundreds of features and access to thousands of charts. Real-time Navigation on Marine Charts – positioning, velocity vectors, tracks history and waypoints. Waypoint Selection, Creation and Editing – Navigate to any Waypoint. Import and export Waypoints. Popular GPX and KML (Google Earth) support. indicates course and direction to turn. Supports NMEA data. Marine Chart Selection – Charts can be displayed based on position, or by search criteria such as name or chart number. Route Editing – Comprehensive Route creation and navigation. Add, delete and insert Waypoints. See total or leg segment distance and bearing. Google Earth and other charting or mapping software. Anchor Alarm – Be notified with both audio and a visual alert if anchor drags more than selected distance. Marina and Navaid Search – Find the place or buoy or other Navaid quickly and see it right on the Chart. AIS Targets Plotted on Chart – Quickly see and track near by traffic by integrating an AIS receiver or transponder. Weather and Forecast Integration – Overlay real-time weather, and choose the date and time of the forecast to see it plotted on the Chart. Forecast Plot (Wind and Pressure) – See wind speed, pressure, temperature, or precipitation forecast plotted on the chart. 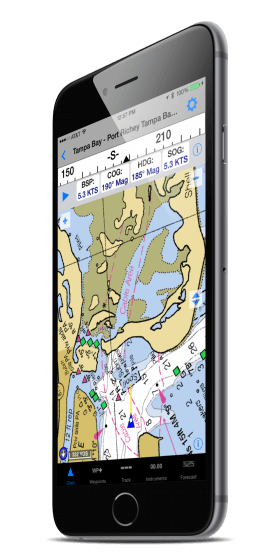 Marine Chart Info – show chart detail and easily update, delete, email or print your charts. data that is received via WiFi.